“…it was a hobbit hole, and that means comfort. It had a perfectly round door like a porthole, painted green, with a shiny yellow brass know in the exact middle. “One of these, Badger flung open, and at once they found themselves in all the glow and warmth of a large fire lit kitchen. The floor was well-worn brick, and on the wide hearth burnt a fire of logs, between two attractive chimney corners tucked away in the wall, well out of any suspicion of draught. A couple of high backed settles, facing each other on either side of the fire, gave further sitting accommodation for the sociably disposed. In the middle of the room stood a long table of plain boards placed on trestles, with benches down each side. At one end of it, where an arm-chair stood pushed back, were spread the remains of Badger’s plain but ample supper. 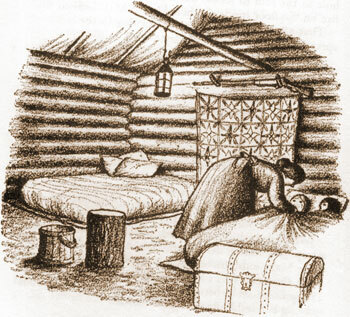 “Mary and Laura lay in their little bed on the ground inside the new house, and watched the sky through the window hole to the east. The edge of the big, bright moon glittered at the bottom of the window space, and Laura sat up. She looked at the great moon, sailing silently higher in the clear sky. It also had windows out into the ocean – the ultimate wall-size fish tank, in fact. Another watery home is that of Kunohara, a character in Tad William’s Otherland: Sea of Silver Light. A bit of background is needed here to make sense of this house, if you can call it that. Otherland deals with computer generated virtual worlds. A mysterious and possibly dangerous method is used to create these worlds, which allows you to experience the virtual space exactly as you do real life – with no lag for processing graphics, and access to all senses including smell and touch. ” The sky curved over him like a weirdly gleaming bowl, and the towering trees which had stretched upwards like pillars holding the heavens now bent over him like bystanders examining and accident victim. Paul felt a solid floor beneath his feet, and turned slowly to discover an entire room behind him, multilevelled, furnished sparsely but attractively with screens and low furniture. Kunohara’s home bobs in the eddying water, and you can look through its lower floor at the stream bed beneath where tiny fish and insects appear like subterranean monsters. A Rivalry of Wizards – a collection of my favourite wizards, with pictures and quotes. in books for some time. There’s a lot of blogs about picture book, which are great but I love to see drawings in fiction too.